Critical Essays on William Blake. Ed. Hazard Adams. Boston: G.K. Hall & Co., 1991. 207 pp. $40.00. The most recent edition to the Critical Essays on British Literature Series, under the general editorship of Zack Bowen at the University of Miami, is Critical Essays on William Blake, edited by Hazard Adams. For this volume Adams includes an introductory essay, sixteen previously published essays, an afterward, and a selected bibliography. His introduction, like the volume itself, is divided into two parts. Morris Eaves, and Morton D. Paley. It is from the critical contributions by Frye, Erdman, Hagstrum, Mitchell, Paley, and Essick that Adams selects six of the sixteen essays as representative examples of modern Blake scholarship. In part two of his introduction Adams provides a rationale for having selected the sixteen essays reprinted for this volume, and for dividing the collection into two parts. The first part of the collection deals with Blake’s reputation in the nineteenth century and begins with Deborah Dorfman’s “Knowledge and Estimation of Blake during His Lifetime,” followed by the well- known criticism of Blake by Robert Hunt in “Mr. Blake’s Exhibition,” Allan Cunningham’s discussion of Blake from Lives of The Most Eminent British Painters, Sculptors, and Architects, and a selection from Reminiscences by Henry Crabb Robinson. Also included in part one is a letter to Alexander Gilchrist from Samuel Palmer providing information on Blake for Gilchrist’s biography. Although the majority of these essays are quite familiar, they are included together here as examples of attitudes toward Blake during his lifetime. The second part of this volume draws from recent Blake criticism and is, according to Adams, meant to be read sequentially. 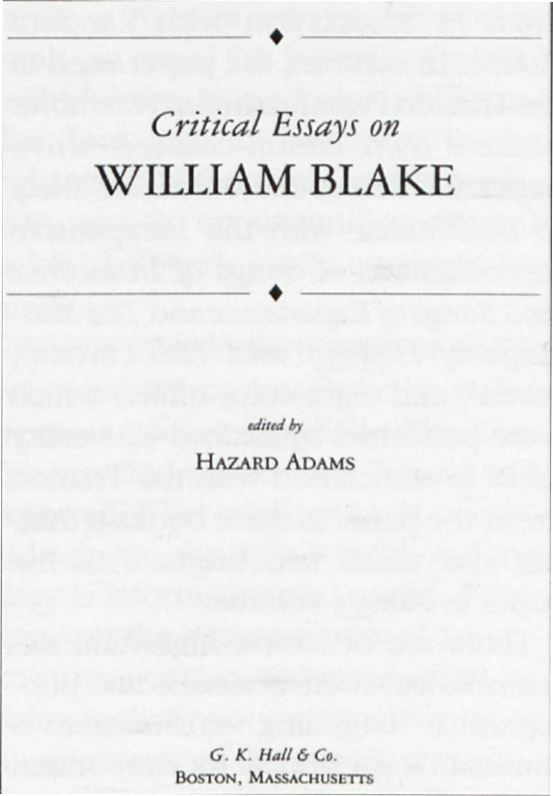 This is a bit curious since Adams does not arrange these essays in chronological order, suggesting instead that the reader’s attention be focused on the varieties of critical discourse rather than a concern for chronological developments in Blake scholarship as the first part of his introduction implies. Part two also includes “Spectre and Emanation,” a selection from Morton D. Paley’s The Continuing City(1983), Steven Shaviro’s article “Striving with Systems: Blake and the Politics of Difference” (1982), and “The Return to Logos” from William Blake and the Language of Adam (1989) by Robert N. Essick, as examples of what Adams refers to as “the so-called postmodern emphasis on difference, deconstruction, Hegelian negation, and language” (6). The inclusion of these three essays by Paley, Shaviro, and Essick, produces a radically different Blake than the one presented in the earlier essays in part two by Frye, Erdman, Hagstrum, and Mitchell. In order to remedy this disparity, it would be more useful to the student unfamiliar with contemporary critical discourse, or for the generalist audience for whom the book is intended, to have divided the book into three sections, with the third section devoted to postmodern approaches to Blake. Given the editorial objectives of the Critical Essays on British Literature Series, one of which is to develop a unique perspective on its subjects, Adams’ strategy is successful. By providing essays on Blake from nineteenth century accounts of him, and, selections representative of major critical directions taken by Blake scholars, Adams’ Critical Essays on William Blake underscores the wide disparity between attitudes toward Blake’s art and poetry by his contemporaries, and the wide range of critical directions taken by Blake scholars in the twentieth century.